I'm pretty sure Netflix's API can filter by country. Many services aren't even available outside USA so those could be completely removed for foreigners. Hey, I'd like to see the ability to localize my streaming links. Example: When I search for a movie I see links to Amazon and Netlix, however these are the US links. As I don't reside in the US this is useless to me. Instead I would prefer to be able to set a "streaming region" and the the links for my local instance of Netflix and Amazon Prime instead. The "Watch Now" buttons seem to be for US visitors. Could you please localise depending on where we are from. I would rather see sites that work here in the UK, and prices in £. Same for other countries. I love trakt, I even just signed up for VIP. But it is so heavily US centric it renders it useless at times, for me. 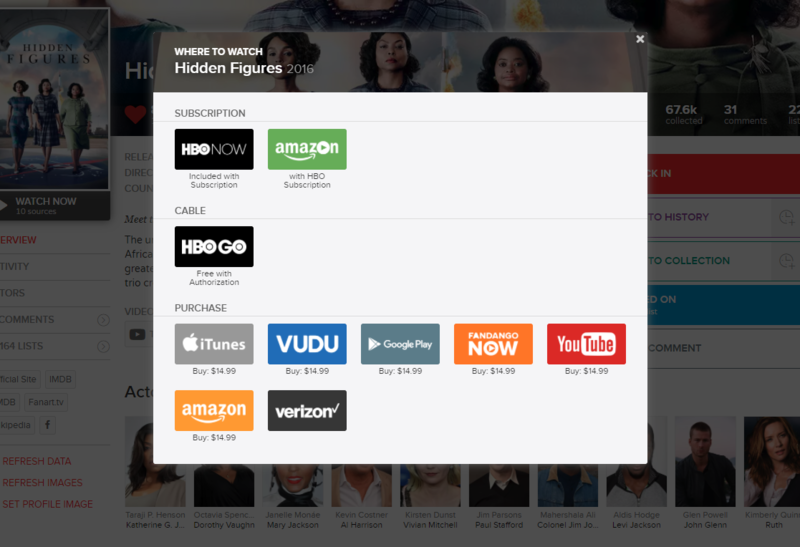 For example, I'd like to know if I can watch Hidden Figures https://i.imgur.com/uYjWLsb.png ...but they're all US services which aren't relevant to me. So, for now I'm having to use Justwatch and manually manage two sets of lists which is a bit of pain. As a low hanging fruit or first step you could support the US providers, like Amazon Video or Netflix, and offer a country option for them. Do the APIs allow such an approach?